It is not particularly unusual to find the sheer raw talent of a singer stripped naked by the glare of the spotlight with her only weapon a wonderful voice piercing through a darkened hall like a siren of distinction . It is only unusual if you consider Sinead OConnors tempestuous career, filled with songs raging in blatant discourse, an appearance and demeanor of raucous rebellion, and questionable tactics budding from an unforgettable aura. Yet, on this night, an oblique, if not attractive woman; draped in an elegant white dress moving sinuously around the stage, served as a testament to a body of work as diverse and edgy as any hard-driving punk outfit. Having seen OConnor at the genesis of her baldheaded, black-army booted, in-yo-face run seven years ago, it was quite a change. Gone were her demonstrative movements, declaring an inner rant which bore clarity to the ugly truth of her lyrics. Only the sting of the lyrics remained, buoyed by the beauty of the melodies and the incredible range and control of a voice that could raise goose bumps on a cadaver. 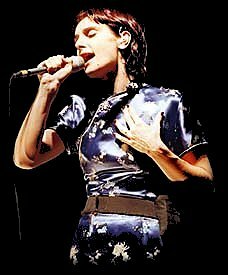 A six-piece band, including cello and accordion, enabled OConnor to stand guitar-free, clutching her ever-present controls for an ear-monitor she uses as a crutch for perfection. The four piece band known as The Screaming Orphans from Northern Ireland, opened the show and more than ably slid into their roles as back-up singers for the evening. At key points their five part harmonies lifted otherwise dreary dirges into sweet moments of orchestra, culminating in the vortex of an Irish folk revival. Swerving through her entire, new six-song collection, Gospel Oak, and touching on choice numbers from her last two original studio works, OConnor was visibly overwhelmed by the roof-raising ovations she received from the more than capacity crowd. (both side aisles were jammed with people standing and applauding throughout). 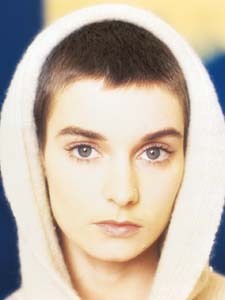 Responding with a wave, a giggle, and a brush of her hand through a full head of brown locks, Sinead OConnor put away the tantrums and overt displeasure her songs evoke, to merely sing them. And to those who recall her being mercilessly booed off the stage at the Bob Dylan tribute five years earlier, it was the best kind of redemption.